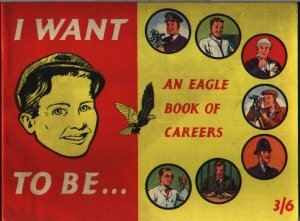 I want to be... An Eagle Book of Careers is a paperback book offering advice and examples of a wide choice of careers for boys in the late 1950's. Each topic is explained by a page of description followed by a single page illustrated story about it. The first advert in the book asks if you would like to run a Nuclear Power Station? Dimensions : 25cm x 18.5cm with 64 pages. Want to be a doctor? It may cost you around £120 per year in tuition, books and instruments! An Architect's salary could be £1,000 or more.